With growing number of Indians rapidly falling prey to the silent killer of a disease - diabetes, it is unsurprising that WHO has deemed India as the diabetes capital of the world! Furthermore, if reports are to be believed, the number is only going to double by 2023. What’s alarming? The rising numbers, for sure. But, more so, the number of people fighting Type-2 diabetes. The one that is caused by obesity and other lifestyle choices. It’s a huge epidemic! Diabetes, across the world is changing lives in an instant. To combat its macro effect on the micro, daily things of life, scientists and health experts are working on solutions to aide help. ● Technological advancement like tattoo ink that changes colour as per your blood sugar levels. Could this change the landscape of the disease in the years to come? ● Are these tattoos advisable for diabetics? Your body’s inability to process and produce glucose and sugar is the primary cause of diabetes. Pancreas produce insulin to provide glucose to your cells. But the inability to keep that up, instead builds sugar in your blood. While the cases of Type-1, where the body can’t secrete insulin are fairly lesser in number, the deadly monster is the Type-2 diabetes, where the body produces insulin but cannot process it. For any diabetic, maintaining normal sugar levels is of key importance. Self-monitoring sugar levels throughout the day is critical in diabetes care. Commonly, the first reading of the day is done to check fasting sugar level i.e before breakfast and subsequently, twice more in the day. Blood sugar levels is the key indicator of your overall health in diabetes. Increased sugar level calls for caution, while too low a level is not a great sign either. In a normal day for a diabetes patient, individuals prick their skin every few hours to check their sugar levels. Perhaps, in years to come, a biosensing tattoo ink that changes colour as per your sugar levels could change the way people approach the disease. How this would work? 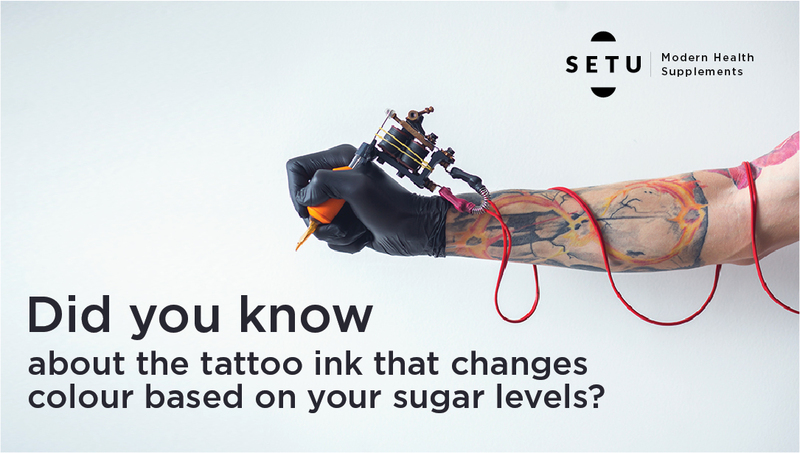 Keeping a close tab on sugar levels has become so important that researchers at Harvard and MIT have developed a colour changing tattoo ink that monitors your sugar level at all times. Your skin acts as the ‘interactive display’ on which the ink also known as the ‘Dermal Abyss’ ink (i.e a liquid with biosensors) changes colour as and when your sugar levels drop or rise. This dynamic ink tracks pH levels, as well as sodium and glucose concentrations within your bloodstream. When your glucose levels rise, the ink turns brown, while the rise of sodium causes the ink to turn green. Changing pH levels would cause the ink to turn pink or purple. A constant and convenient tab of sugar levels with this tattoo could be boon for every diabetic individual. This advancement could help individuals alter their diet, change their exercise regime, take precautionary measures before the condition worsens and more so, can manage their daily lives better. But, every diabetic patient is hounded by the constant fear and the complexity of having a tattoo. While, it is true that the decision of getting a tattoo for a diabetic individual involves serious precautions and evaluation, it is does not mean that they cannot have one. However, an advice from your doctor about the same could be the best way to go.